Well here it is, your first real look at RAGE 2. The post-apocalyptic open world shooter is being co-developed by id Software and Avalanche Studios, so you've got what seems to be very DOOM-esque shooting mixed with a chaotic sandbox. In short, it looks very promising in terms of gameplay. It's not quite as colourful as we thought it would be, though, at least going by the title's live action teaser trailer. There are a lot of browns and greys, and, obviously, fiery explosions. Vehicle combat also looks like it'll be a big part of the experience. The game's currently pegged for a 2019 release, but we'll be apparently be seeing much more of it at E3 2018 during Bethesda's press conference. Cool. 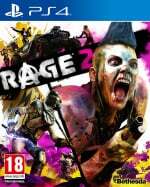 How do you think RAGE 2 looks? Lock and load in the comments section below. I think it looks pretty good, if just a little bland. Very interested in seeing how mental the action can get — there's some footage where the screen is packed with enemies, almost like a battlefield. It looks cool, maybe I will buy it on the release date, let’s wait for more details. They should put Rage Against the Machine on the trailer. Amateurs! Actually looks like a lot of fun. Was hoping for a bit more of the silly pink stuff from the reveal trailer, but gameplay looks good. As I tweeted earlier, the reveal trailer for Rage 2 looked like a cheap syfy version of Mad Max Fury Road that's been hit with various tester paint pots for a feature wall you'll never finish. This trailer is a bit more promising. Whoa! Looks like we have a new #1 on my most-wanted games list! Looks like Doom had a baby with Blood Dragon and they live in Fallout world! Interesting. I'm curious to see more at E3. Wow this looks like great fun, DOOM is still comfortably the most satisfying shooting action of the last decade or so and if this even comes close it could be amazing. It looks pretty good. Looking forward to learning more about it at Bethesda's E3 conference. The game looks good, the problem with doom is the gameplay is great but that game is really repetitive, I hope this game have doom gameplay and open world games system / variety (upgradeable weapon, leveling up for player, etc). Looks better than I thought it would. I think more color would have helped it stand out more, though. But then people would accuse it of copying Splatoon, especially with the music being somewhat similar already. It would almost be a poor man's Splatoon. Coop would give me a borderlands vibe and would definitely have me consider. But if only single player, I'm not sure would have to see what makes this game worth a purchase with other games on the market in the same genre, with imo fallout at the top of that genre. It's a lot more colorful than Rage 1. @Star-Lord What would make it more-Rage-y to you? Personally, I'd like to see more robots and gadgets, since I loved throwing down turrets and spider-bots to take care of grunts while I focused on the big enemies, etc. Also...@MrOso what's wrong with Bulletstorm! Haha. I'm actually gonna go pick the PS4 version later today since it finally dropped from $40 to a much more reasonable $20. Now there's an IP that I wish Bethesda had, since they're apparently good about not giving up on old franchises. I see doom and bulletstorm mixed up in this. But did anyone ask for this? Doom FPS + Mad Max Car Combat? That actually looked decent. This is a game that could be a lot of fun in Co op with some mates. Sold, sold, and sold ! Loved the first one, and Avalanche games are pretty good. Looks brilliant, count me in! The best bit was the drunken raider's party antics spinning around his gun. Enjoyed the first game, but this looks a tonne more fun. Those giant mutants look epic. There's different environments as well by the looks of it, not just a desert wasteland. They also seem to have kept the quirkyness of the first game. I rarely play FPS games anymore, so I'm not 100% sold on it, I will have too see more videos. @smelly_jr Rage is not fast-paced shooter like Doom. Rage should be average FPS like Fallout or Far Cry. In trailer it look so Doom-y FPS imo so I guess have to wait for more next month at E3. SOLD and then some. Loved the first, and this looks great. Where do I sign, boys? Wow that actually looks really good!! The foggy forest sections especially look lush and beautiful! Im officially excited!!! @ApostateMage yeah i hope there are a lot of dynamic random moments through the open world like that. Like youre wondering around and come across drunks or abnormal situations. still looks a bit naff to me.. looked a bit like borderlands (without the humour) mixed with doom mixed with mad max. might depend how much of the game is reliant on vehicles/vehicle combat. if it's integral.. i'll definitely pass. @MrOso Whaaat! Bulletstorm generic? You outta give it another try! It may look generic, but the gameplay is anything but. Trying to pull off the dozens and dozens of trick-shots with all the weapons really sets it apart, IMHO...but if you just ignored that aspect of the game and shot all the enemies normally (which you could technically do), then it's definitely an ordinary experience. As for LawBreakers...don't get me started! Now there's a game (er, WAS a game) that gutted out everything I didn't like about Overwatch and ended up with a faster, tighter, and more fun (IMHO) experience. Such an incredible game. R.I.P. But I digress. This has actually tempted me to go and pick the first Rage up and give it another go, i remember finding it quite repetitive but the gunplay was good, i might wait just to see if this is a direct follow-up or more of a reboot, story-wise. Please don't have racing. Please don't have racing. Please don't have racing. Please don't racing. Not for me. Rather get Days Gone. Read that it also has competitive multiplayer and co-op. I guess their abandoning deep story for "competitive-repetitive fun!" I actually really like the look of this game, I enjoyed Mad Max quite a bit and this essentially looks like a first person shooter version of that. The similarities to the art styles and design of the characters is pretty striking which makes sense since Avalanche is developing it with ID.